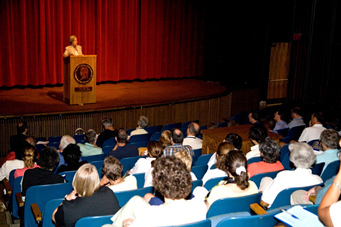 The theme of the Global Connections 2007 Seminar, held at The Hotchkiss School, was “Connecting Global Learning Communities.” Presentations and discussions provided participants with an opportunity to evaluate educational practices and their bearings on the global citizens of the 21st Century, irrespective of their geographical location. It was not all work though; a trip to the United Nations, a few hours to explore New York city, an opportunity to attend the Hotchkiss Summer Portals classes, daily free time to use the athletic center or to take a walk in the woods, and the three Chamber Music performances, provided a manageable pace to the Seminar. Participants valued sharing stories about partnerships between schools and programs (student exchanges, collaborative service projects abroad, a growing emphasis on understanding national issues along with an awareness of international problems, etc) that arose out of previous Global Connections workshops and forming new connections for future projects and undoubtedly found value for their time and money at the Seminar. The ‘GC Seminar initiatives’ and the ‘Panel of School Heads’ podcasts are available on this website. See a photo album of the seminar. Dr. Shirley M. Tilghman, President of Princeton University, in her keynote address emphasized that it is imperative to have educational programs with a strong global perspective because “the subjects our students study, with whom they study, and where they study, as well as the opportunities that we provide for them to encounter what is unfamiliar both here and abroad, will color their vision of the world and shape their interactions with its peoples for the rest of their lives.” She provided examples of the different approaches Princeton and other American Universities are taking to internationalize themselves “while maintaining their national identities, a balance that must be carefully struck if cosmopolitanism, with its dual appreciation of the universal and the particular, is to take root.” Her reference to a research publication: ‘Rising Above the Gathering Storm: Energizing and Employing America for a Brighter Economic Future’ authored by the Committee on Science, Engineering and Public Policy (COSEPUP), and the Policy and Global Affairs (PGA) committee, conveyed the message that if institutions, organizations and individuals are self-evaluative and strategic, it is possible for them to provide superior leadership and direction. President Tilghman’s address inspired every educator in the room to equip our students with the essential knowledge, skills and attitudes to work effectively in todayÃ‚Â¹s networked global economy. Read the entire keynote address here. The panel discussion, on Wednesday, July 11, by Boyd Roberts (The International Global Citizen’s Award), Ian Desai (Linking Individuals Through Education) and Hugh Riddleberger (The Center for International Education) offered three imaginative approaches to help students (and adults) develop an awareness of and connection to the world outside the confines of their classes. Networking with individuals and/or organizations within the locality, the country and internationally, is a way to awaken the mind to different ideas and perspectives, possibly helping develop an action based response to address matters. We’re hopeful that networking will hopefully break the “hierarchy that creates distance from the people or is closed to alternatives proposed by ‘outsiders’. People must be able to chime in, and be heard, when they have something to contribute that will deal with the issue at hand”( Rischard, J.F, High Noon – 20 Global Problems and 20 Years To Solve Them). Thursday, July 12 was devoted to a day-long workshop with Alan November, a consultant and a leader in Technology education. Using innovative, inexpensive, and effective community building tools like Skype, social networking through Del-icio-us, the Host: command and RSS (Real Simple Sydicate) participants worked at their laptops transforming the enormous wide world to digital signals at their work stations. Despite the fact that most participants were overwhelmed by the volume of information, they were also appreciative of being better informed about the tools the current generation (Digital Natives) of students use. Ethical and safety issues related to Internet access, sparked a lot of energy within the group, just as did AlanÃ‚Â¹s process of evaluating a URL. Alan was himself so inspired by the personal and professional stories some participants were willing to share that he decided to prepare a podcast of their rich experiences. This podcast will be available on the GC site soon. Friday, July 13 was New York day, a time when a lot of bonding and informal exchanges of ideas among the participants took place. The highlight for the New York trip was the convocation by a group of New York City educators, sharing their insights about challenges and triumphs of the initiatives put in place by Mayor Michael Bloomberg and Chancellor Joel Klein, to improve the quality of the city’s public education system. Reducing school size, providing in-service training to teachers, increasing student and faculty accountability, and developing a well-planned curriculum helped improve graduation levels from a mere 30% to around 78%. The young presenters at this convocation were truly committed to eliminating educational inequality for students from underprivileged backgrounds. Their energy and their enthusiasm to make a difference are unstoppable. Their program is a case of networking within a local community to bring about positive change. Earlier that day, the tour of the United Nations building, although brief, was much appreciated particularly since the visit gave a tangible dimension to the humanitarian and peacekeeping projects undertaken by the UN. Saturday’s presentations given by heads of school were as varied as the context in which the schools are situated. Suman Kumar, principal of Bluebells School International in India, spoke about the different clubs started in solidarity with major world movements (like the anti-apartheid club, the Palestinian club, etc), the international sports day events organized along with embassy schools in New Delhi and the Book club as means to create a global awareness among students at her school. Eric Widmer, Head of King’s Academy in Jordan, mentioned that the access to knowledge and information via the Internet would inadvertently over-ride the censorship of text books by the Jordanian Govt. Students at his school already have a working proficiency of English, but one of the goals of his school is to encourage students to be familiar with their heritage. The school teaches Middle-Eastern history, Islam and Arabic within the western model of a liberal arts education. The ‘reading for pleasure’ time in the middle of the day should instill in the students a love for reading and an education of issues outside the academic confines. Malcolm McKenzie brings the strength of working on two different continents and two different systems of education, as he prepares to lead Hotchkiss School into the realm of International education. 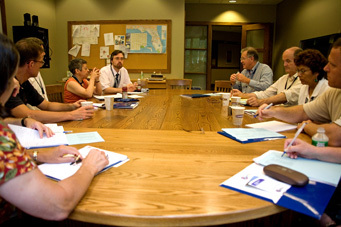 Developing school-based programs for the IB Diploma program at UWC (World Religions, Peace and Conflict studies, Local Geology, possibly Human Origins in Kenya), focus weeks, teacher and student exchanges, and an emphasis on perceptions and skills rather than on a checklist of global values, projected the true internationalism practiced at UWC. I particularly liked MalcolmÃ‚Â¹s statement “we with our similarities can also be wrong”, because to me it suggests that consensus may not always be correct and also that the collective is willing to consider the minority input, an essential element to open the channels of communication. Theodore Faunce, Head of Chinese International School in Hong Kong, did not talk about programs at his institutions of work and study, but emphasized the need to empower our youngsters by providing them with appropriate tools to be players in finding solutions to issues that are of concern. He left us with a question of how to measure whether various programs that claim to be developing global citizenship, have or are making an impact on students’ values and the choices students and adults make in being effective global citizens. Promote and practice the ethics of sustainable living of the Global Connections Organization and the “need for schools to be both local and global institutions” (Global Connections 2007 Declaration). There was discussion about the future of Global Connections. By an overwhelming consensus among the delegates, it was decided to keep the Global Connections Organization in its current format. The next Seminar (2008) will be hosted by the Prem Tinsulanonda Center for International Education, Chagmai, Thailand.